I’m really excited about the potential of a new app called MathChat. It is an app that allows students to key in problems, start to solve them, and when they get stuck have their peers comment and help. It is kind of a mobile version of the OpenStudy website. 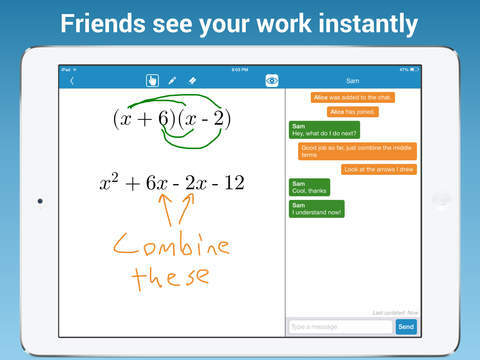 A couple of perks: as students work through expressions/equations, MathChat checks their work line by line. It only tells them if it is equivalent or not. The student still has to find the mistake and fix it. Also, MathChat uses the touch capabilities of the mobile environment, so that peers can give you help by writing on your problem. This is a real nice touch. It is early and I haven’t really had a chance to test drive this app with students, but the app holds a lot of promise. On the heels of UCONN’s surprising win, here is an article about a Davidson professor, who has created a whole course around the mathematics of bracketology. That is a course I’d love to take. I just got back from the ICTCM math/tech conference. I had a great time and learned a lot. Two things I wanted to pass on. Both MyMathLab and Mathematica are going to be viewable on mobile devices. I had actually heard about MyMathLab for a while now. The news about Mathematica was new though. I’m really excited because you can create such amazing manipulatives for students. The problem has been that those manipulatives have been locked into Mathematica’s CDF format. And admittedly anyone can get a CDF viewer for free by downloading, but who wants to deal with that! I’ll be implementing it in my online classes a ton now. 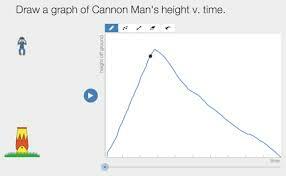 Function Carnival is the coolest site I’ve ever seen to develop graphing intuition among students. If you are a math teacher, doing the walk through at the top of the page is a must. 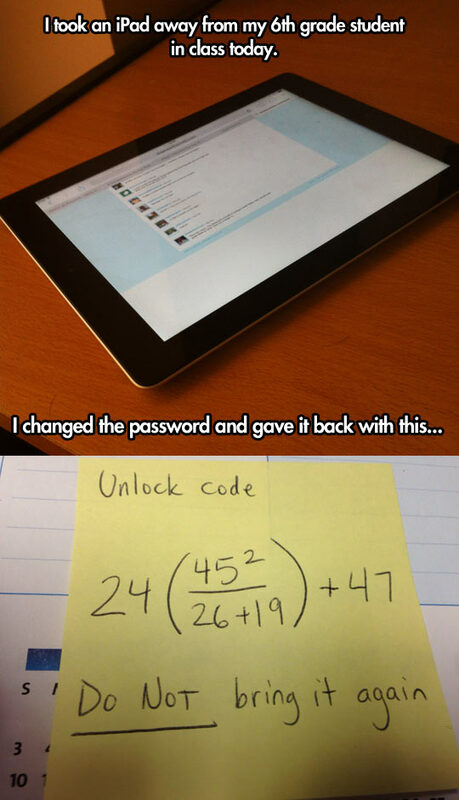 It is so clever. This is the second thing Desmos has released in the last 6 months that has blown my mind. Check out this other post on modeling. I caught a NY Times editorial on Jump Math and got curious. There are a lot of curriculums that claim to significantly improve student math performance. What intrigued me most about Jump Math is that it claims to push the extremities in a given class together. I hadn’t heard this before. That sounds fantastic. Imagine if you got everyone in your class working at a B+ to A level? That got my attention. Has anyone worked with this curriculum? There is a new PBS math channel on YouTube I learned about from Free Tech for Teachers. The content level is pretty basic, but it could be a nice review for students. I know a number of my algebra students still struggle with integer operations. I especially like the quiz video above. Very clever use of a YouTube video. The production quality, being PBS, is also a bit higher than a lot of the math videos around. Here is a way to factor trinomials that I’d never seen before. 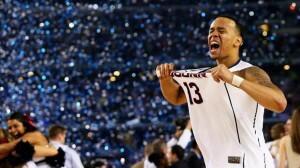 It came my way via the tutoring center. I’m working on a proof, but it seems really convincing. Check it out. It is a lot easier than the reverse foil or AC-methods. Does anyone know who came up with it? Will Dan Meyer Ever Stop Being Awesome? Modeling is one of those things that we all want to put in our classes, but so many of the pre-made activities stink. 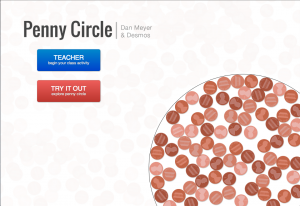 But check out this activity that Dan Meyer put together with the help of Desmos.